today i herd a grate commotion at grandma's and montoya running into the barn. when i got to the fence, the chickens was under the ramp screaming, penny and grandma was headed across the pasture with penny barking and grandma screaming like a wild woman, and pore george was running toward grandmas as fast as her legs would carry her . . . but not as fast as the chicken hawk was closing in on george. well, i let out a huge woof woof (huge is the only kind of woof woof i have) and just as the hawk was about to pick up george, he decided he would rather not have chicken for dinner if he had to face me. 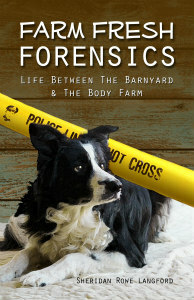 he was about 3 feet from poor george when he lifted off and disappeared behind the barn. grandma says i'm a good chicken dog and i can have ALL THE EGGS I WANT! For more on Briar and George, read: "I will name him George"
Well done, Briar, well done!!!! I still think you should use that picture of Briar and Roany hugging for a Christmas card.....she's turned into quite the asset for the farm, hasn't she??? Hahaha! No Briar doesn't collect the eggs. Mom collects them and rations extras to the dogs! Briar has turned into quite the asset on the farm. She zealously guards the sheep and goats. The chickens benefit from the fact that NOTHING moves in the barnyard without Briar knowing it. I've been very impressed with her natural ability to bond to livestock and guard them. She certainly earns her keep. Good for Brier! She's the jolliest looking LGD I've ever seen. I have to smile every time I see a picture of that woolly beast. 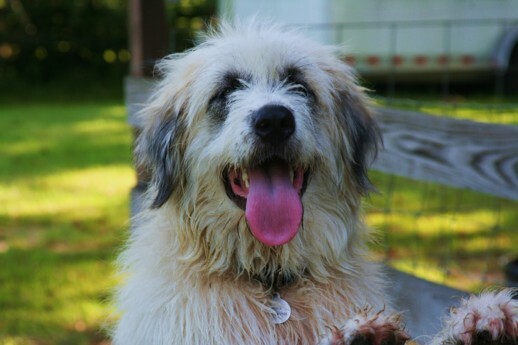 We have 4 LGDs of various Pyr/Anatolian/Akbash and have seen them do some mighty strange and amazing things. We especially like watching an older dog break in a newbie on the routine, like no chasing the critters, etc. We have 2 that we keep with our hens and they've been excellent at spotting any large bird flying over the pasture and chasing it from corner to corner. However, our big ol' Bear dog, just can't abide a guinea hen and nearly wiped out the dozen keets I raised. Anyway, we surely do like the blog and both the DW and I try and keep up with the goings on down there. Hooray for Briar!! Briar, does G'ma intend to keep you at her house after you eat all the eggs you want? My dogs get extremely serious gas from eating eggs. The kind of gas that wakes me out of a sound sleep sort of gas. Hahahaha! Briar stays outside (to guard the livestock!) and so Briar Farts aren't a big problem. (But you should smell the Blue Heeler Farts when Ranger gets into the kitty litter box!) Eegaaads!